I come from a game-loving family that as you might guess, is also slightly competitive. We play to win and we don’t always lose well. On a beach trip 30 years ago, I beat my cousin Bob in one miniature golf game, a loss that he has yet to let go of, even though the entire trip after that became a nonstop rematch where he trounced me every time, at every last putt putt course in Ocean City, MD. There are pictures from my wedding of us visibly arguing about that game. It is the one time I’ve ever beaten him at a game and he will never ever get over it. There was a beach trip with my extended family a few years ago where Pat discovered that I came from a game playing family. “How did I not know this about you? How do you come from this family and you hate to play games?” he asked. “Give it a few days and you’ll see” I answered. By the end of the week, my cousins had announced they would never again play poker with Pat – who managed to take most of their cash in a completely annoying idiot savant way. “Wait, I won?” he was quoted as saying when he laid the cards down on the winning hand in question. There may have been tears involved. He did indeed figure out by the end of the week why I don’t play games, especially with my family. This means of course, that Edie comes by her competitiveness honestly. Once, during one of our marathon power outages that lasted days on end, the neighborhood gang started a monopoly tournament. The big boys taught Edie to play, I’m sure thinking they could easily win, only to realize that she was incredibly cut throat and serious as a heart attack about beating them at their own game, which she did of course. She has since been banned from their monopoly games and they are steadily realizing that it’s not just monopoly she plays to win at, it’s every game. She might think beating them at Madden Football was a fluke, but they don’t. 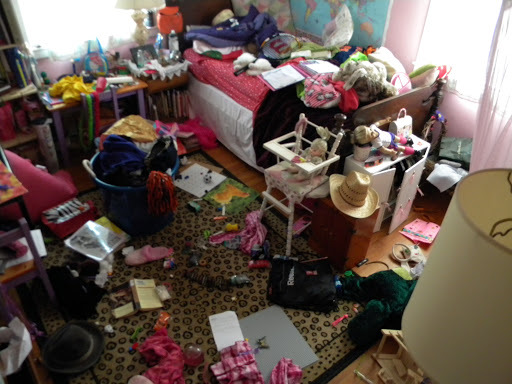 I do have to follow that shot up however, with the announcement that after trashing her room, she then proceeded to clean it and has kept it neat ever since (and I will get around to shooting photo of it and posting that one as well, really). Because she’s kept it clean, I’m going to let her choose her prize. While I’m disappointed she won’t be choosing a credit for the Civility School, I do take comfort in the knowledge that she has fairly impeccable manners – knowing her, she’d have herself a job lined up as a T.A. by the end of a modern manners course there because that’s just how she is. In it to win it as politely as possible. I agree, go big or go home. Nice job, Miss E.
Excellent! Congratulations on the win! Atta girl! I love her competitive spirit! She'd fit right in here!